A cult-hit series influenced by action-platformers of days past takes its vision further with a new installment that looks to capitalize on one of gaming's hottest genres. But does it deliver to audiences looking for niche indie gems? When it comes to horror in video games, the first thing that might spring to mind for most gamers is Resident Evil, Silent Hill, or any other notable survival horror franchise. However, one of the early horror-inspired trendsetters was the NES action-adventure platformer, Metroid. The gamer’s journey through a large, dark planet filled with creatures to fight and secrets to find was influenced by Ridley Scott’s Alien. One of Metroid’s sequels, Super Metroid, would become an influence for another all-time classic and horror-inspired game, Castlevania: Symphony of the Night. SotN became the forefather of a new gaming genre, Metroidvania, where players have to traverse through a large, open-ended world filled with a wide variety of rooms and power-ups. By getting these power-ups, players are not only able to explore further into the world, but also go back to previous areas to access new ones, all while dealing with various enemies and traps along the way. I’ve been playing a good number of Metroidvania games lately as they’ve become more popular in the past few years. 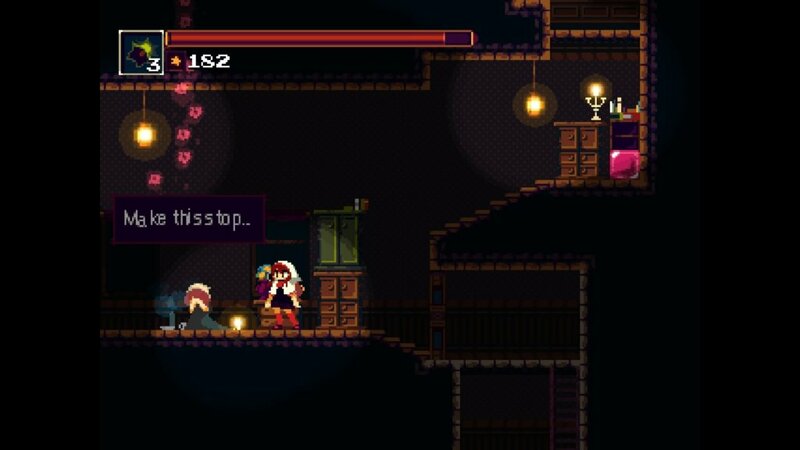 While there are some great Metroidvania games to talk about, I want to focus on one game that mixes cuteness and horror in one charming package: Bombservice’s Momodora: Reverie Under the Moonlight. After discovering it via the Humble Bundle’s Overwhelmingly Positive Bundle 2 set, I think it’s a good game that helps introduce players to the world of Metroidvania games with its retro presentation and tight gameplay mechanics. What’s The Hype For Momodora? 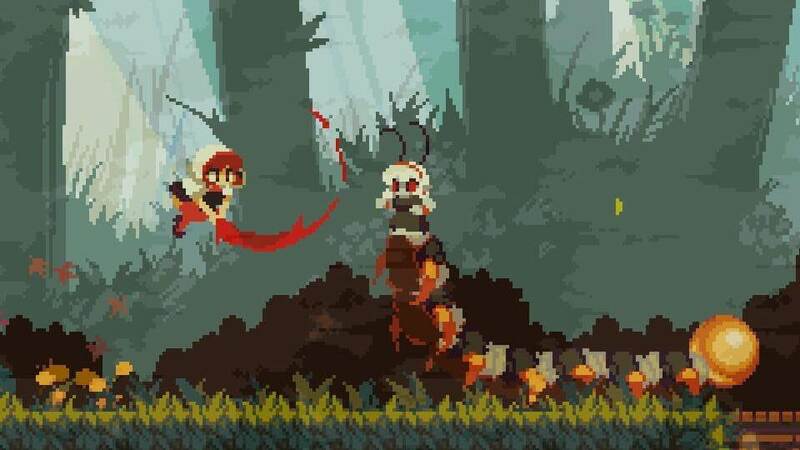 For anyone that doesn’t know what Momodora is, it’s a series of NES-inspired action-platformers where you play as priestesses wielding magical maple leafs to kill demons. There are 4 mainline games released, with Reverie Under the Moonlight (RUtM) being the latest and biggest release yet. 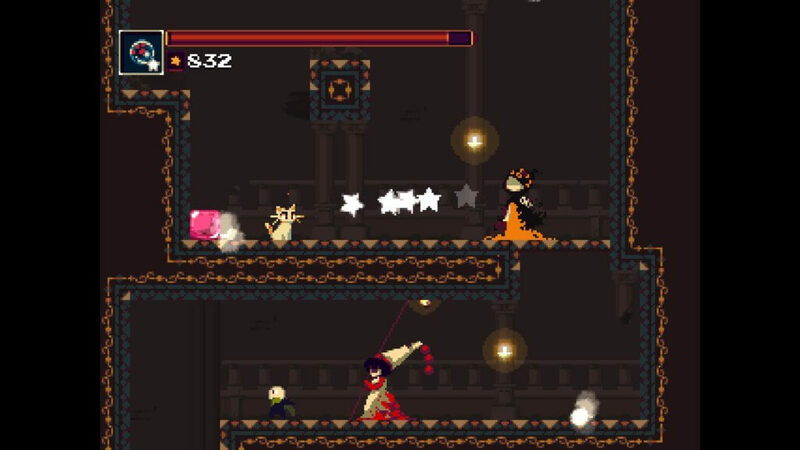 RutM serves as a prequel to the 1st Momodora game, and has you play the role of a young priestess named Kaho Reinol, whose quest is to get rid of a demonic curse infecting an entire kingdom called Karst. When the curse becomes so big that it reaches her home village, Kaho goes out to stop it, deciding that she must speak with the queen of Karst. However, not all is as it seems, as Kaho has to traverse a city filled with demons, while its citizens slowly become insane from the curse. RUtM has you ready to go after its short introduction. Kaho can run, jump, double-jump, roll, and roll-jump as basic ways to get around. She is armed with a maple leaf for melee, a bow for ranged materials, and special items for attacks/healing/buffing when found. The controls for the game are very responsive. Every action you input is quickly set into motion. I love how mobile Kaho is at the start of the game because there are areas where you have to dodge and hit enemies in tight corners. There’s a good amount of challenge in RUtM that’s manageable for the most part. The game has 4 difficulty modes: Easy, Normal, Hard, and Insane (unlocked after beating Hard — all enemies one-shot kill you if you get hit). The difficulty of Dark Souls was an influence in RUtM’s gameplay design, and it makes the game rewarding for players who want something that’s truly retro. 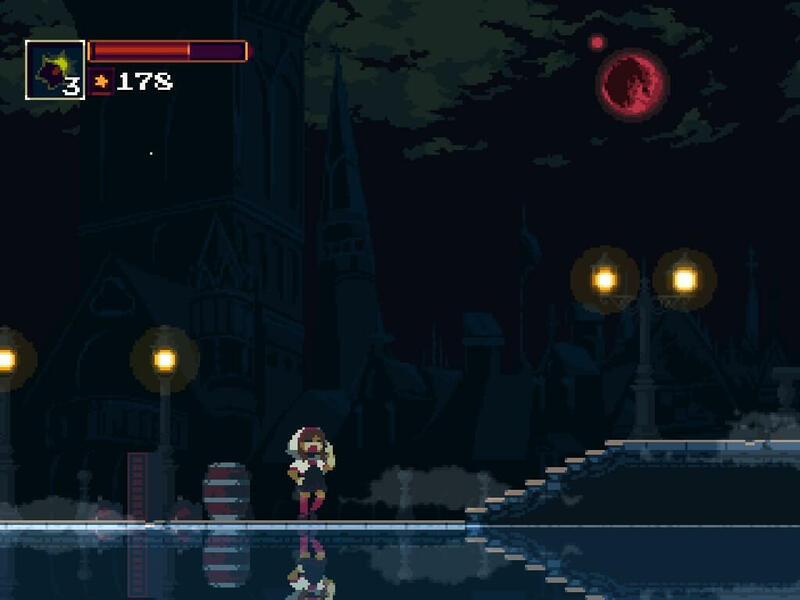 The presentation is unique, as it mixes cute 2D pixel sprite art (which looks very anime-inspired) with a foreboding soundtrack. The various areas are also fun to explore. Like many Metroidvania games, expect a good number of secrets and power-ups to find, though not as much as in larger games of the genre. The start of the game has you traveling through a peaceful grove before arriving at Karst. Once you set into Karst, everything becomes a bit creepy (in a good way). The enemy designs look somewhat adorable, but when they attack, they will start to freak you out a bit. I found the boss designs to be neat, with one particular boss’ design basically screaming anime. Though I found the game fun, I had a problem with the story presentation. As you progress through RUtM, Kaho runs into several non-playable characters who warn her about the curse and/or try to give her advice. Unfortunately, most of them only show up once and that’s it. Even one very important character who shows up multiple times doesn’t get that much development. For a game that has anime-inspired art, Bombservice could have used a bit more anime-inspired storytelling to have more cutscenes/interactions between characters. This seems like a lost opportunity, as RUtM takes place 400 years before Momodora 1, and the series’ characters are beloved by its fans. Speaking of the Dark Souls influence, expect to die a lot. For one thing, you lose a decent amount of life, even on Normal. When you get to Karst the difficulty starts to pick up fast, as enemies won’t hesitate to welcome you with projectiles and melee attacks out of nowhere. The whole part I said about rooms with enemies/traps/pits at once – there’s a decent amount of them. You have to be patient in getting through this game. I played the game on Normal, as I was familiar with action-platformers, but its platforming elements still wrecked me most of the time. I wound up feeling that I would rather deal with the bosses than the areas. While the bosses do hit hard (and take a lot of damage from you as well), you can work through them with trial and error, and save points are available right before them. I still find RUtM worth playing. The story could be a bit more ambitious (and creepy too), but its artwork and gameplay make this a quirky purchase for fans looking for cute and dark media to enjoy. I’ve been told that the game has tones similar to ZUN’s Touhou Project series, with their commonalities being maidens fighting evil spirits, so RUtM may also appeal to Touhou fans. The game is also great for anyone who loves Dark Souls-like games and old-school platformers, due to the various difficulties. 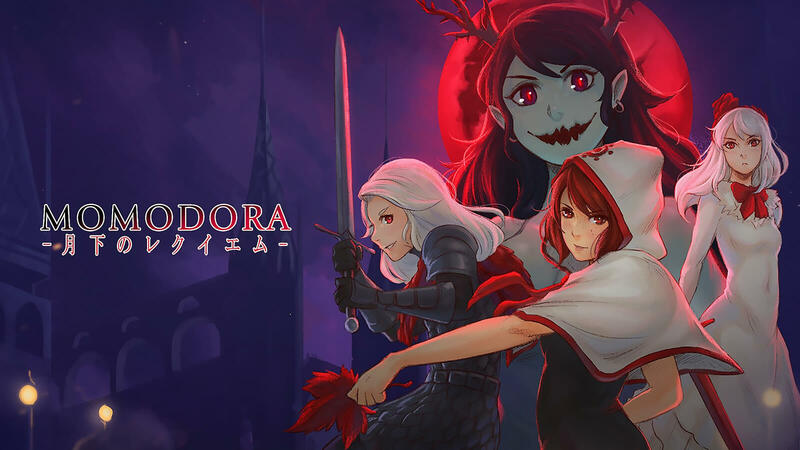 The Momodora series has been praised for being challenging platformers made with heart, and RUtM delivers its concepts to a mainstream audience with success. Even when dreams are fleeting, RUtM is a short yet pleasant one, filled with love and respect to the gaming genres that made it come true. Momodora: Reverie Under the Moonlight is available on Steam, PC/OSX/Linux, PS4, and Xbox One. A Switch version is currently in the works.